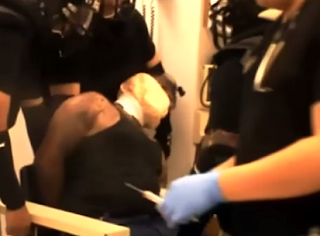 A brutal video obtained by KFOX14, shows the last heartbreaking moments of an active-duty Fort Bliss soldier, 26 year old Sgt.James Brown, as he was being assaulted by the riot squad in the El Paso Country Jail. The video below clearly depicts the absolute horror Sgt. Brown experienced at the hands of the merciless riot squad. Warning: The footage obtained by KFOX14 contains graphic content. Viewer discretion is advised. Brown served two tours of combat duty in Iraq. The decorated 26-year-old was on active duty at Fort Bliss in July 2012, when he left his family for the weekend to self-report for a two day DWI sentence at the El Paso County Jail. When he checked in, jail records show that Brown reported in writing to the jail that he was diagnosed with post-traumatic stress.